This article covers Colorado's historic period, when events were recorded. 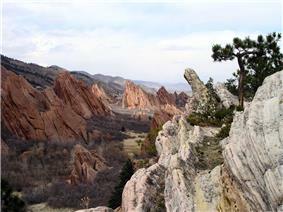 For Colorado's prehistoric history, go to Prehistory of Colorado. The human history of Colorado extends back more than 13,000 years. The region that is today the state of Colorado was first inhabited by Native Americans. The Lindenmeier Site in Larimer County, Colorado, is a Folsom culture archaeological site with artifacts dating from approximately 8710 BCE. When Spanish explorers, early trappers and hunters and gold miners visited and settled in Colorado, the state was populated by Native American nations. Westward expansion brought European settlers to the area and Colorado's recorded history began with treaties and wars with Mexico and Native American nations to gain territorial lands to support the transcontinental migration. In the early days of the Colorado gold rush, Colorado was a Territory of Kansas and Territory of Jefferson. On August 1, 1876, Colorado was admitted as a state, maintaining its territorial borders. Apache Nation — An Athabaskan-speaking nation that lived in the Great Plains in the 18th century, then migrated southward to Texas, New Mexico, and Arizona, leaving a void on the plains that was filled by the Arapaho and Cheyenne from the east. Arapaho Nation — An Algonquian-speaking nation that migrated westward to the base of the Rocky Mountains in the late 19th century and settled on the piedmont and the eastern plains. They were relocated entirely out of Colorado in 1865 following the Colorado War. Cheyenne Nation — An Algonquian-speaking nation very closely related to the Arapaho. Like the Arapaho, they migrated westward in the 18th century to the base of the Rockies. They often lived in bands interspersed among the Arapaho, and were also relocated out of Colorado in the 1860s. Comanche Nation — A Numic-speaking nation that lived on the High Plains of southeastern Colorado. Closely related to the Shoshone, they acquired the horse from the Spaniards and roamed the southern Great Plains. The Comanche were removed to Indian territory. Shoshone Nation — A Numic-speaking nation that inhabited intermountain valleys along the north edge of the state, especially in the Yampa River valley, up through the late 19th century. Areas included North Park and Browns Park. Ute Nation — A Numic-speaking nation that has lived in the Southern and the Western Rocky Mountains for many centuries. 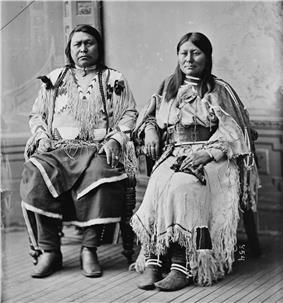 Their leaders were Chief Ouray and his wife Chipeta. They often clashed with the Arapaho and Cheyenne, and resisted the encroachment of these nations into the mountains. Until the 1880s, the Ute controlled nearly all of Colorado west of the continental divide, a situation that eroded after the silver boom of 1879. After clashing with white settlers in the 1880s in the Meeker Massacre, they were nearly entirely relocated out of the state into Utah, except for two small reservations in southwestern Colorado. The first Europeans to visit the region were Spanish conquistadors. Juan de Oñate who lived until 1626, founded what would become the Spanish province of Santa Fé de Nuevo Méjico among the pueblos of the Rio Grande on July 11, 1598. In 1706 Juan de Ulibarri claimed the territory of Colorado. In 1787 Juan Bautista de Anza established the settlement of San Carlos near present-day Pueblo, Colorado, but it quickly failed. This was the only Spanish attempt to create a settlement north of the Arkansas River. Although the Spaniards did not establish permanent settlements in Colorado, they traded with Native Americans who lived there. In 1803 the United States acquired a territorial claim to the eastern flank of the Rocky Mountains by the Louisiana Purchase from France. However, the claim conflicted with Spain's claim to sovereignty over the territory. Zebulon Pike led a U.S. Army reconnaissance expedition into the disputed region in 1806. 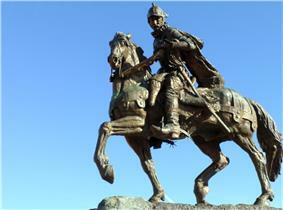 Pike and his men were arrested by Spanish cavalry in the San Luis Valley, taken to Chihuahua, then expelled from México. Miguel Hidalgo y Costilla declared Mexico's independence from Spain on September 16, 1810. In 1819, the United States ceded its claim to the land south and west of the Arkansas River to Spain with the Adams-Onís Treaty, at the same time purchasing Florida. Mexico finally won its independence with the Treaty of Córdoba signed on August 24, 1821, and assumed the territorial claims of Spain. Although Mexican traders ventured north, settlers stayed south of the 37th parallel north until the United States signed a peace treaty with the Ute Nation in 1850. 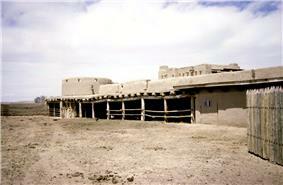 Trading posts such as Bent's Old Fort served fur traders in the early 19th century. During the period 1832 to 1856, traders, trappers, and settlers established trading posts and small settlements along the Arkansas River, and on the South Platte near the Front Range. Prominent among these were Bent's Fort and Fort Pueblo on the Arkansas and Fort Saint Vrain on the South Platte. The main item of trade offered by the Indians was buffalo robes, see Early history of the Arkansas Valley in Colorado. In 1846 the United States went to war with Mexico, and the defeated nation was forced to relinquish its northern territories by the settlers avoided the rugged Rocky Mountains and those headed for the Oregon, the Deseret, or California, usually following the North Platte River and the Sweetwater River to South Pass in what is now Wyoming. On April 9, 1851, Hispanic settlers from Taos, New Mexico, settled the village of San Luis, then in the New Mexico Territory, but now Colorado's first permanent European settlement. On June 22, 1850, a wagon train bound for California crossed the Green Russell party eight years later. Members of this party founded Auraria (later absorbed into Denver City) in 1858 and touched off the gold rush to the Rockies. The confluence of Clear Creek and Ralston Creek, the site of Colorado's first gold discovery is now in Arvada, Colorado. The following year, Little Dry Creek (in present-day Englewood) that yielded about 20 troy ounces (622 grams) of gold, the first significant gold discovery in the Rocky Mountain region. News of this discovery soon spread and precipitated the Pike's Peak Gold Rush. An estimated 100,000 gold seekers flocked to the region over the next three years. The placer gold deposits along the rivers and streams of the region rapidly played out, but miners soon discovered far more valuable seams of hard rock gold, silver, and other minerals in the nearby mountains. This gold rush helped to attract people to the state and resulted in a population boom. The Territory of Colorado was organized in 1861. 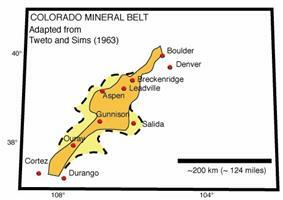 The Union control over a mineral rich area of the Rocky Mountains. Statehood was regarded as fairly imminent, but territorial ambitions for statehood were thwarted at the end of 1865 by a veto by President Andrew Johnson. Statehood for the territory was a recurring issue during the Ulysses Grant administration, with Grant advocating statehood against a less willing Congress during Reconstruction. The Battle of Washita River. The United States Congress passed an enabling act on March 3, 1875, specifying the requirements for the Territory of Colorado to become a state. On August 1, 1876 (28 days after the Centennial of the United States), U.S. President Ulysses S. Grant signed a proclamation admitting the state of Colorado to the Union as the 38th state and earning it the moniker "Centennial State". The borders of the new state coincided with the borders established for the Colorado Territory. Governor Davis H. Waite campaigned for the Constitutional amendment granting women the right to vote in Colorado. Governor Waite is also noted as one of the few elected officials ever to call out the state militia to protect miners from a force raised by mine owners. Governor Waite belonged to the Populist Party. Participants in the Pike's Peak Gold Rush from 1858 to 1861 were called Fifty-Niners and many of the new arrivals settled in the Denver area. Gold in paying quantities was also discovered in the Central City area. In 1879, silver was discovered in Leadville, resulting in the Colorado Silver Boom. Many early mining efforts were cooperative ventures. However, as easy-to-reach surface deposits played out, miners increasingly turned to hard rock mining. Such industrial operations required greater capital, and the economic concept of mineral rights resulted in periodic conflicts between the mine owners, and the miners who increasingly sold their labor to work in the mines. As the mines were dug deeper, they became more dangerous, and the work more arduous, creating the conditions for conflict. 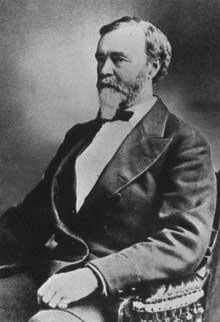 In 1880, Colorado Governor Pitkin, a Republican, declared martial law to suppress a violent mining strike at Leadville. In the 1890s many Colorado miners began to form unions in order to protect themselves. The mine operators often formed mine owners' associations in response, setting up the conditions for a conflict. Notable labor disputes between hard rock miners and the mine operators included the Cripple Creek strike of 1894 and the Colorado Labor Wars of 1903-04. Coal mining in Colorado began soon after the first settlers arrived. Although the discovery of coal did not cause boom cycles as did the precious metals, the early coal mining industry also established the conditions for violent confrontations between miners and mine owners. The usual issues were wages, hours, and working conditions, but miners were also concerned about issues of fairness, and company control over their personal lives. Early coal mining in Colorado was extremely dangerous, and the state had one of the highest death rates in the nation. During the three decades from 1884 to 1914, more than 1700 men died in Colorado's coal mines. Coal miners also resented having to pay for safety work such as timbering the mines, and they were sometimes paid in scrip that had value only in the company store, with the cost of goods set by the company. A strike in 1913 resulted in the 1914 Ludlow massacre. Another coal strike in 1927 is best known for Colorado's first Columbine massacre. In 1933, federal legislation for the first time allowed all Colorado coal miners to join unions without fear of retaliation. Like all resource extraction, mining is a boom or bust industry, and over the years many small towns were established, then abandoned when the ore ran out, the market collapsed, or another resource became available. There were once more than a hundred coal mines in the area north of Denver and east of Boulder. The mines began to close when natural gas lines arrived. Coal and precious metals are still mined in Colorado, but the mining industries have changed dramatically in recent decades. Reports of the revival of molybdenum mining in 2007 resulted in ambivalent responses with Leadville welcoming the opening of the mine at Climax, but strong opposition in Crested Butte over proposed operations at Mount Emmons. Opinion in Rico, site of the Silver Creek stockwork Molybdenum deposit is more divided. There, land slated for development is being bought up by a mining company. Starting in the 1860s, when tuberculosis (TB) was a major deadly disease, physicians in the eastern United States recommended that their patients relocate to sunny, dry climates for their lungs. As a result, the number of people with tuberculosis, called "lungers", in the state grew alarmingly and without the services or facilities to support their needs. Not knowing how to manage a population of homeless, ill people, many were taken to jail. 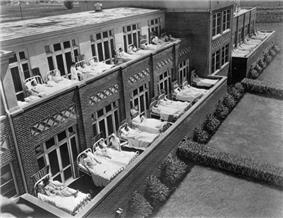 Because of the number of people with TB and their families who came to Denver for their health, by the 1880s it was nicknamed the "World's Sanitarium". Cynthia Stout, a history scholar, asserted that by 1900 "one-third of Colorado's population were residents of the state because of tuberculosis." In the early 1920s, the Ku Klux Klan was an important political force in Colorado, but it was unable to get any of its proposals enacted into law, and it died out by 1930. The 1930s saw the beginning of the ski industry in Colorado. Resorts were established in areas such as Estes Park, Gunnison, and on Loveland Pass. During WWII, the 10th Mountain Division established Camp Hale to train elite ski troops. In the 1940s, the Republican governor of Colorado, Ralph Carr, spoke out against racial discrimination and against the federal internment of Japanese-Americans during World War II. In 1967, Governor John A. Love signed the nation's first liberalized abortion law. The late 1960s saw violence in Denver, in the form of race riots, and college buildings being burned by radicals. In 1972, Colorado became the only state to reject the award of hosting the Olympic Games after they had been granted. When Representative Lamm led a successful movement to reject a bond issue for expenses related to hosting the event, the International Olympic Committee relocated the 1976 Winter Olympics to Innsbruck, Austria. No venue had rejected the award before nor has any venue since. In 1999, the Columbine High School massacre became the most devastating high-school massacre in United States history, when Eric Harris and Dylan Klebold killed 12 students and one teacher before taking their own lives as well. On July 20, 2012, not far from the location of the aforementioned massacre at Columbine High School, 12 people were killed and 70 people were injured in the 2012 Aurora shooting, when James Eagan Holmes, a former neuroscience doctoral student, walked into an Aurora, Colorado Cinemark movie theater with multiple firearms and tear gas grenades, and started shooting at random at people trying to escape during a midnight Thursday showing of The Dark Knight Rises, killing 12 people and injuring 70 others. It was the deadliest shooting in Colorado since the Columbine High School massacre and, in terms of both the dead and wounded in the number of casualties, was the largest single mass shooting in U.S. history. Colorado is now 1 of 4 states that have legalized both medical and recreational marijuana, allowing them to tax the product. As of July 2014, six months after recreational shops began sales of marijuana in Colorado, the state has enjoyed a tax revenue of 45 million with 98 million expected by the end of the calendar year. This is in addition to increased economic revenues from "pot tourists." ^ Gehling, Richard (2006). 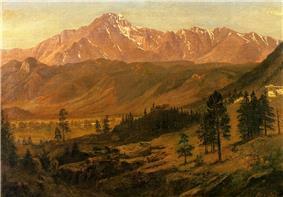 "The Pike's Peak Gold Rush". Richard Gehling. Archived from the original on 2008-06-28. Retrieved 2007-06-12. ^ William Wyckoff (1999). 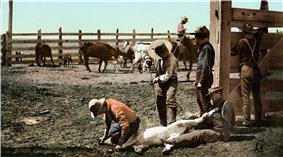 Creating Colorado: The Making of a Western American Landscape, 1860-1940. Yale UP. p. 267. ^ 10th Mountain Division History Metropolitan State College of Denver, 2004. Retrieved January 30, 2010. ^ "Officials release complete list of injured victims in Aurora massacre"
^ "Officials release complete list of injured victims in Aurora massacre". Fox News Channel. January 10, 2013. Retrieved July 4, 2013. ^ Brown, Jennifer (July 21, 2012). "12 shot dead, 58 wounded in Aurora movie theater during Batman premier". The Denver Post. Retrieved July 21, 2012. Athearn, Robert G. Rebel of the Rockies: A History of the Denver and Rio Grande Western Railroad. 1962. Ellis, Elmer. Henry Moore Teller: Defender of the West. 1941. Ellis, Richard N., and Duane A. Smith. Colorado: A History in Photographs. 1991. Gulliford, Andrew. Boomtown Blues: Colorado Oil Shale, 1885-1985. 1989. Hafen, Le Roy R. Colorado: The Story of a Western Commonwealth. 1933. Hogan, Richard. Class and Community in Frontier Colorado. 1990. Ormes, Robert M. Guide to the Colorado Mountains. 7th ed. 1979. Schulten, Susan. "The Civil War and the Origins of the Colorado Territory," Western Historical Quarterly (Spring 2013) 44#1 pp 21–46. Varnell, Jeanne. Women of Consequence: The Colorado Women's Hall of Fame, Johnson Press, Boulder, 1999, ISBN 1-55566-214-5. Wyckoff, William (1999). Creating Colorado: The Making of a Western American Landscape, 1860-1940. Yale UP.